How one attorney is getting creative with the law in order to help Israeli women who seek divorce. The excerpt below is from a work in progress by Susan Weiss, founder and executive director of the Centre for Women’s Justice (CWJ). For more than 20 years, Susan has been actively working to find solutions for the problems of Israeli women seeking divorce. 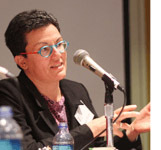 She began her crusade first as a private attorney, then as the founder and director of Yad L’Isha from 1997 to 2004, and finally in her current position at CWJ. In 1999, Hanna was 36 years old. An ultra-Orthodox woman, Hanna was the mother of six children and had lived apart from her husband for the last 10 years when she came to my office for advice. Though she desperately wanted a get, Hanna had not set foot in a rabbinic court since 1994. At her last hearing, the tribunal tried to persuade her to surrender her half of the family home and to waive her entire child support award, past and future, in exchange for the get. These were her husband’s conditions for the get and they were, to say the least, not acceptable to Hanna. When she rejected those terms, the tribunal blamed Hanna for her state of marital limbo. She absolutely refused to go back to the rabbis for help. And meanwhile, she had used up the conventional and not-very-effective arsenal available to Israeli divorce attorneys to try and convince her husband to give her a get, of his own free will of course. I suggested to Hanna that she sue her husband in tort. Academics had for some time raised the possibility of recovery in tort for get-refusal. But in 1999, there had been no successful attempt to do so, inside of Israel or outside of the country. Hanna, however, had nothing left to lose; and I, as a cause-lawyer for an NGO, had been waiting for her case. In 2000 Hanna filed a claim for damages against her husband for get-refusal. She argued that her husband’s refusal to divorce her caused emotional harm and infringed on her basic rights to marry and have children. In December 2001, on the same day that Hanna’s husband agreed to give her a get in exchange for the dismissal of her petition, the Hon. Judge Ben-Zion Greenberger of the Jerusalem Family Court denied a motion to dismiss the complaint (File 3950/ 00). He held that get-refusal is a tort since it violates a woman’s personal autonomy protected under the Basic Law: Human Dignity and Freedom. Similar law suits followed. A few months later, Judge Philip Marcus ruled that get-refusal is a tort because it breaches the statutory duty to obey court decisions under section 287 (a) of the Criminal Law Ordinance (File 9101/00). Like Greenberger, Marcus did not need to quantify the amount of damages that the husband owed his wife. Here too the husband gave his wife a get in exchange for the dismissal of her damage claim. In December 2004, Judge Menachem HaCohen ruled on the merits of a case, awarding a wife 325,000 NIS in damages, and another 100,000 NIS in aggravated damages (about $100,000 in total) (File 19270/03). HaCohen held that get-refusal was a “tort” because it was unreasonable behavior that fell under the rubric of negligence, section 35 of the Tort Ordinance. And in 2006, Judge Tzvi Weitzman, following the logic of Judge HaCohen, ordered the estate of a man to pay his estranged wife 711,000 NIS in damages (about $180,000) (File 19480/05). I know of 25+ tort cases that have been filed against recalcitrant (non-compliant) husbands since 2000. 63% of the plaintiffs are religious women (ultra-Orthodox or religious-Zionists); 33% of the plaintiffs are not religious (secular or traditional); 4% are unknown. These women waited, or are waiting, an average of 10 years for their get. Of the 25 women in the sample who sued for get-refusal, the longest amount of time a woman waited for a get was 29 years (her husband died). Of the 25 women in the sample who sued for get-refusal, 17 (the vast majority) of women waited, or have been waiting, between 7 and 11 years. 12 women “closed” their tort cases before the family courts could render a decision in them. 10 women agreed to dismiss their cases with prejudice (they can’t reopen the cases) in exchange for the get. 9 of the 10 husbands gave the get. 1 husband reneged on his promise. The 9 women who received their get had lived an average of 8 years apart from her husbands; but they waited an average of only 12 months for the get from the time that they filed for damages. 2 women agreed to dismiss their cases without prejudice (they can reopen their cases). In these cases, the wives closed their files in response to pressure from the rabbinic judges. It has been 2 years since these (religious) women have withdrawn their tort cases and they still have not received their get. In 1 case, the rabbinic court put the husband into solitary confinement for refusing to give a get. In the other case, the rabbinic court has not yet ordered the husband to give a get. Both these women have been living apart from their husbands for 8 years. They are both in their mid 30’s. 3 cases were decided by the family courts. As mentioned, in 2004, J. HaCohen awarded 425,000 NIS to a haredi woman. The wife collected on the judgment but her husband has still not given her a get. They have been living apart for 15 years. In 2006, J. Weizman awarded 711,000 NIS to a secular woman. She had been living apart from her husband for 29 years when he died without having given her a get, or leaving her any money. She sued her husband’s estate and collected damages. In 2008, J. Maimon denied a secular woman’s petition for damages, holding that the woman had abandoned her quest for a divorce over the years, and so had not proven her case. The woman is deciding whether or not to appeal. Even in this case, the husband gave the wife a get 2 years after she sued for damages. They had been living apart for 26 years. The rest of the cases are pending. New cases are being brought on a regular basis. The excerpt above was taken from How the Tort of Get-Refusal can Help Unravel the Israeli Version of the Multi-Cultural Dilemma: Theory and Practice Susan Weiss is an editor of The Law and its Decisor (a quarterly journal published by Bar Ilan University Law School), initiated the innovative tactic of filing damage cases against recalcitrant husbands in the Israeli civil courts, and has written extensively about Jewish women and divorce. Susan is an attorney with an MA in sociology and anthropology and is currently a doctoral student at Tel Aviv University.